Welcome to my review of the Evolve Audio Soundbar SB-2501. Evolve Audio are a relatively new brand, owned by Janky Inc, one of the world’s largest manufacturers of satellite products. The Evolve Audio Soundbar is designed to provide a much better audio experience with your TV. The SB-2501 looks stylish and a quality item from the moment you unbox it. The soundbar itself is made from a brushed aluminium cabinet that houses the latest audio technology. Its 49mm slim profile adds to the entire image. The Evolve SB-2501 includes 4 EQ settings (music, movies, sports, news), independent bass control, touch sensitive LED display, full function remote and integrated wall mount brackets. It uses less than 0.5W in standby so it is energy efficient. The Wireless Subwoofer incorporates wireless HD Lossless Technology. The subwoofer is fairly compact, measuring approx 250mm wide by 336mm deep. The wireless HD technology utilised by Evolve Audio is a digital wireless and lossless non-compression audio transmission technology that is significantly more efficient than Bluetooth. This has the added benefit of providing more audio detail. Using this wireless lossless technology also delivers real time sound from your TV ensuring no lip-sync issues. It also has a USB socket for recharging the EVO-1 headphones. For ease of setup, the subwoofer is pre paired too. The headphones deserve a further mention as they are a welcome addition to the offering by Evolve Audio. 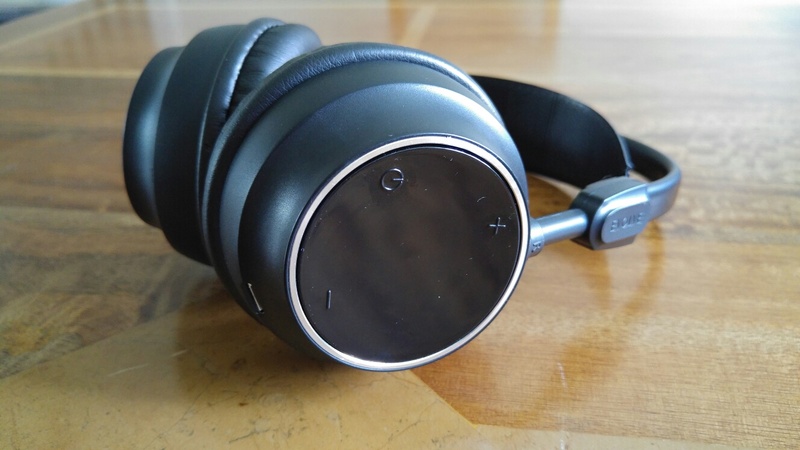 The EVO-1 headphones use atom drivers. These are extremely powerful neodymium magnets made with rare-earth material and are twice as powerful as regular ferroferric oxide magnets. Apart from making these sound good, they are also lightweight and energy efficient. Recharging the headphones is a breeze as the subwoofer has a USB socket for recharging them. Of course, you can use the provided micro USB cable to recharge the headphones on another USB socket. Using the headphones couldn’t be simpler. Press the power on button to turn on or off, and use the volume controls to decrease or increase the sound. These are clearly marked and easy to feel. To change the input source simply use the remote. Again, like the subwoofer, the headphones are pre paired ready to use out of the box. The remote control is a cracking piece of kit and clearly designed by somebody who watches movies and thought “What would be really useful to include on a remote control”. So from the remote control you can adjust the volume, bass level, mute, 3D DSS mode, effects, input, screen dimming level and bluetooth. The screen can be dimmed and switched off too. If you want to pair a bluetooth device eg your iPhone it’s a one touch operation of pressing the bluetooth icon on the remote. In use, this remote control makes life so fast and fun to operate the soundbar. The soundbar has all the connections on the rear. This includes the power switch and connector, 3 AUX jacks one of which is digital. All the respective leads are provided in the box too. See main specifications. Evolve Audio have integrated UniPhase into the soundbar. This is a frequency separation technology that delivers a consistent audio wave form from all drivers, without discrepancy or interference. This translates into a high quality music listening experience. The soundbar has 2 rubber feet that are screwed onto the bottom. This allows it to rest on a flat surface, but these can be removed and used as the wall mounting bracket. The main screen is touch controllable so if your remote control has temporarily vanished, all is not lost. The first challenge of any new product is the setup. Evolve Audio provide a Quick Start guide and a full manual. The Quick Start guide was clear and concise and made the whole process effortless. Added to the fact that all the cables are included, the remote control battery is also included and the headphones and subwoofer come pre paired, it is one of the easiest systems I have connected. And so few wires too! In use the standout was the quality of the sound. I connected my mobile phone in seconds via bluetooth and boom, the SB-2501 was pumping out great sounding music tunes. Time to watch a movie, and once again great sounding music. Switching back to using my TV speakers was a harsh experience as you realise just how awful they are. The remote control is fantastic. Flipping between the different effects was easy. Muting, dimming, or changing the input so quick. Bass to heavy, just press the bass minus button. 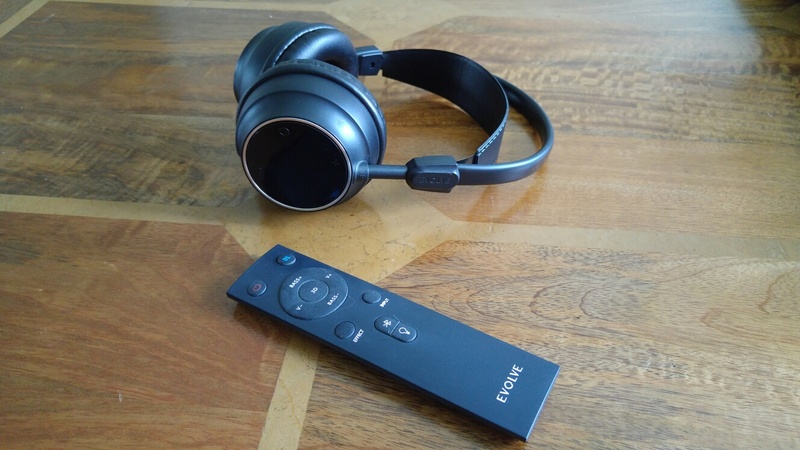 Turn on the EVO-1 headphones and the soundbar mutes automatically. Power off the headphones, and the soundbar goes automatically into mute. This prevents accidental blasting out of music late at night. I really enjoyed using the Evolve Audio SB-2501 soundbar. It is easy to setup. Even easier to use with some real life thought gone into making the operation a breeze. Includes wireless headphones and subwoofer. Incorporates tons of technology which in layman terms equates to good quality music reproduction. Impressive piece of kit and recommended.